Believe Dream Create with Maria: Stencil Hop with Nathalie Kalbach's StencilGirl Oldtimer Stencil! 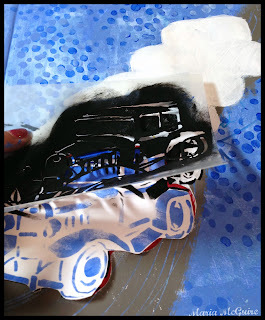 Stencil Hop with Nathalie Kalbach's StencilGirl Oldtimer Stencil! 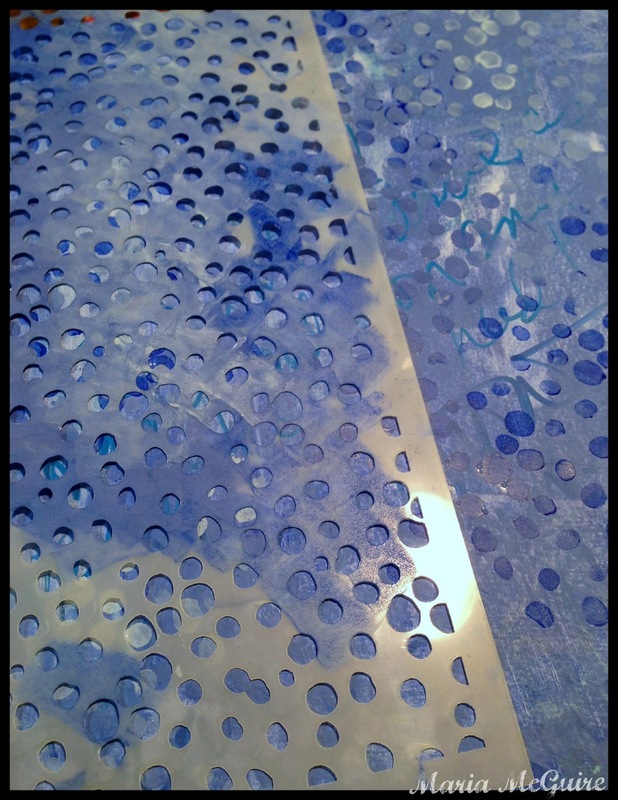 Welcome to the Nathalie Kalbach StencilGirl Stencil Hop! 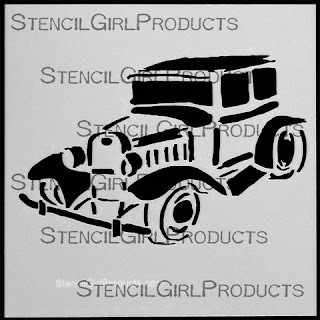 Nathalie has designed some awesome stencils for StencilGirl (who I happen to be VERY partial to) and we are here to showcase her Oldtimer Stencil. Scribble some random thoughts in my head with a variety of paint markers. 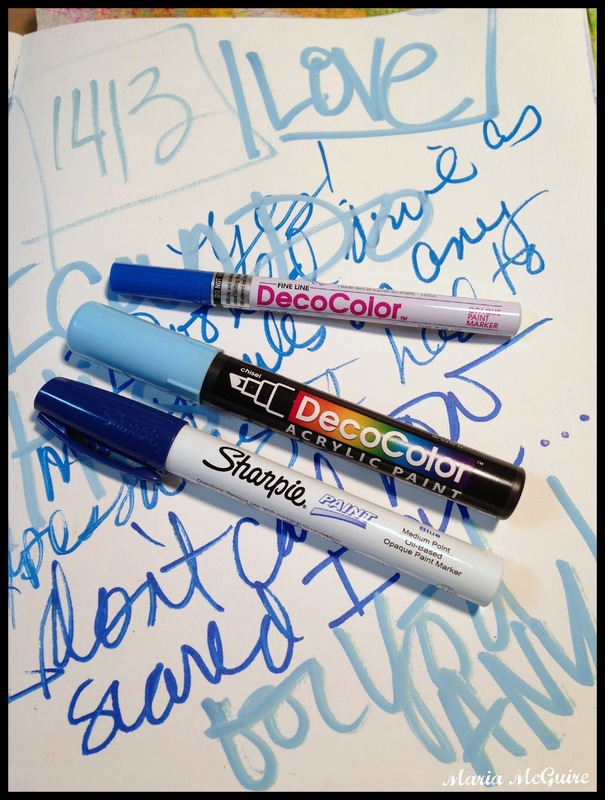 Scrape white, light blue and dark blue paint over the page. Don't worry :) the left over went onto another page that was waiting. I then used another of Nat's StencilGirl stencils, What's the Point, with the same colors to add some texture to the blue. 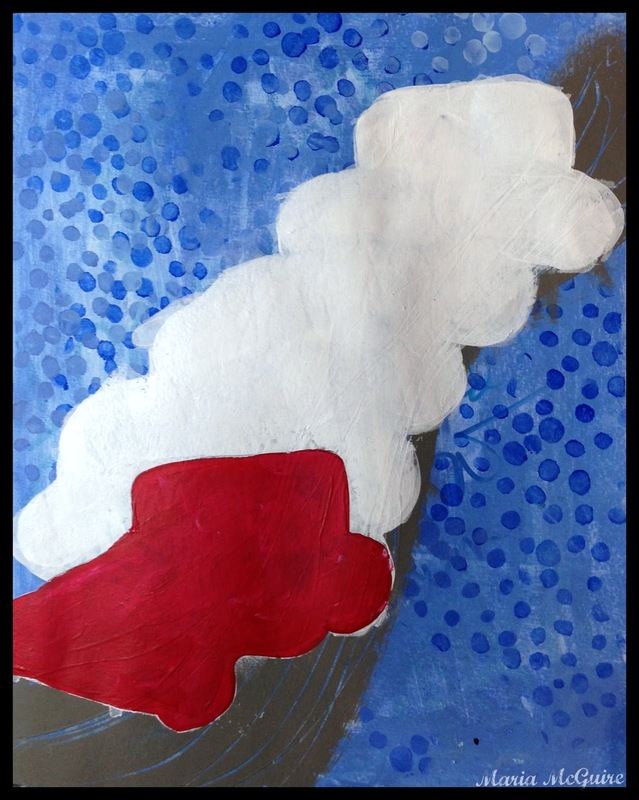 I then took some grey paint and painted a road and scratched through it with the end of my paintbrush. 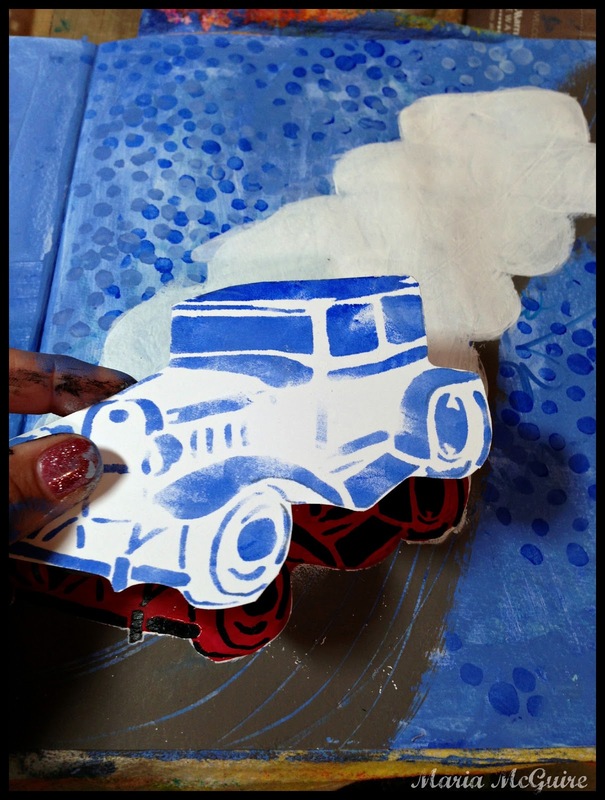 I used the Oldtimer Stencil over and over moving down the road. Yes, I could have stopped here and been happy, but I kept going. Then I painted in all the cars with white gesso--except for the first one which I did red. On a scrap piece of paper I used some left over blue paint to make a stencil mask. 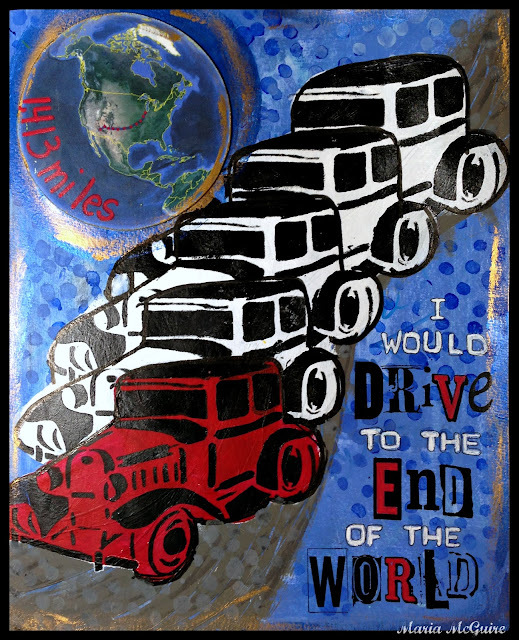 I stenciled over the red car with black paint. Then in order to not distort each of the next car images I put the mask over the previous car. I continued this all the way to the top. The globe in the corner tells my story. 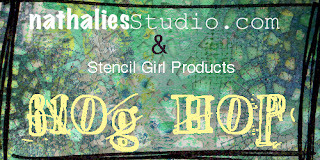 Want a look at all of Nathalie's StencilGirl Stencils??? 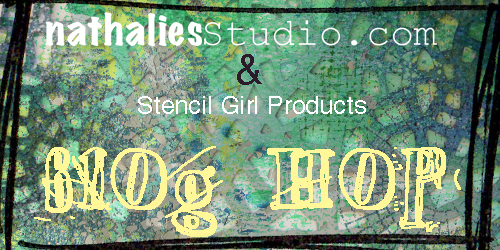 You can find them over at StencilGirl! I'm pretty sure you might find a GIVEAWAY over at Nat's Blog :) BUT...she tells me if you comment here too you will have another entry into her giveaway! 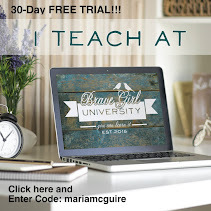 As a matter of fact she will give you an entry into the giveaway for each blog you comment on--how cool is that! A BIG thank you to my friend, Nat,for including me in her hop! Oh I love this- and such a clever idea too!!! Beautiful - and I am sure it is hard to see your son leaving the"nest" :) Thank you so much for playing along Maria- I love it!!! Thanks Gunvor! I'd love to see what you do! Love, love, LOVE what you have created here! A bittersweet moment that will be cherished through your artwork! So dynamic! Thanks Kathy! Bittersweet....yes, yes it is! Thank you for the tutorial! I love how you used the stencil and it's outcome! It's a special day when the kids are leaving home for the big World! Amazing!!! 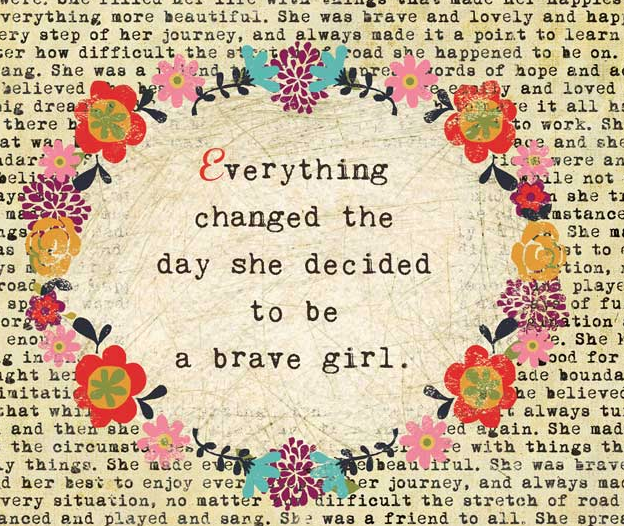 Love this and so appreciate the step by step! Good luck to your son in college! So Sentimental Maria! It's beautiful! Fabulous! Love how you used the car - with the pop of red on the first car! 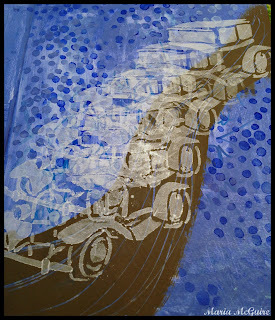 What a way to draw the eye through the whole page by creating the line of cars!! Love that little globe in the corner and the way you repeated the stencil combined with text! Awesome! Thanks Mary! I need a map from Chicago to Arizona :) Just trying to give you some inspiration, LOL! Perhaps might be a good subject for one of your future works of art! Great work and I love how you showed us the process! Awesome! I love the line of cars! 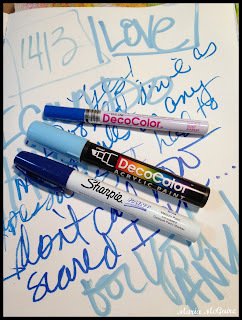 I feel like I know all of you too when I see you commenting on StencilGirl :) Thanks for stopping by today! How awesome is this??!! You put alot of time and energy into this project and it definitely paid off - beautiful! Thank you for the tutorial. I imagine one can do this process with any larger icon on a stencil, as opposed to a stencil with multitude of small graphics. i.e. one large circle vs many small dots. TFS! Yes Laura that would work perfect! I do it all the time. Thanks for stopping by! What a wonderful way to commemorate this special time! Thanks for the tip on making masks and using them with the stencils. You've created a very strong image! Thanks Rhonda I appreciate your comment! Very original. I love it. 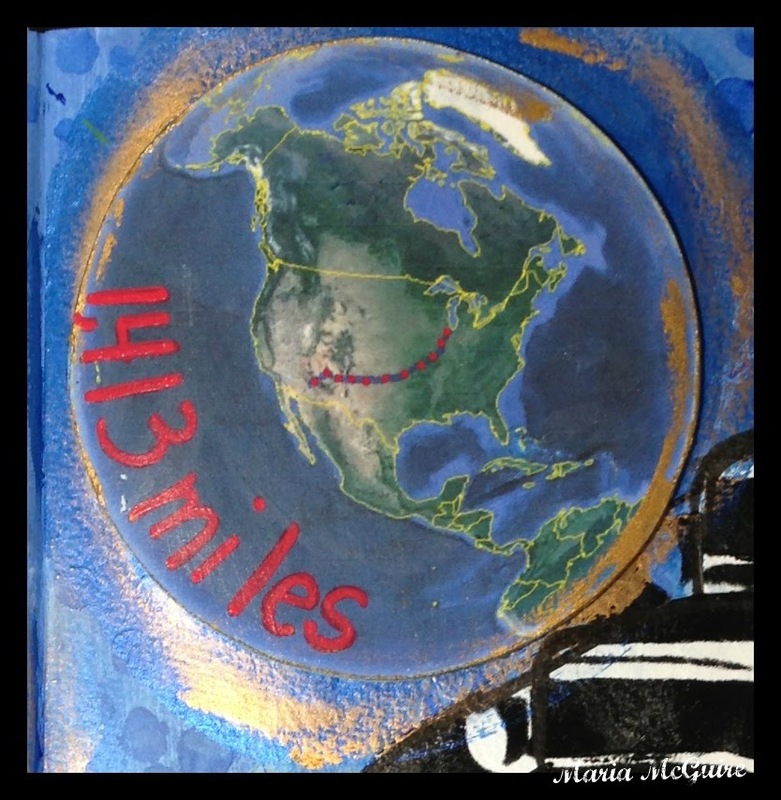 Thanks for sharing, Johanne L.
Love your project! So much to look at and I appreciate seeing the process! In the next to the last picture, are you spraying the black? So many titles you could use on this! Enjoyed the hop and seeing so many ways to use the stencils! Will hop thru again, try to implant those ideas in my head! Thanks for the chance to win, love to play with it ! 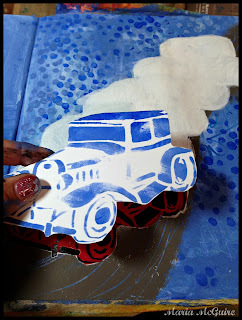 Janelle--no that is the black paint still on the stencil from when I stenciled it with black on the red car. 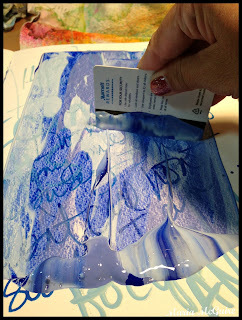 I am showing that I am putting the stencil over the mask. Hope that helps! Thanks for stopping by! I loved the repeating use of the stencil. It gives such a feeling of movement. Each project on the hop has just gotten better. I love how you did the line of cars and the quote that you used is unique and appropriate for your son's journey to come. Thanks Sue, I appreciate your comment. Wow a traffic jam on paper! I love it. What a great idea putting the multiple images in your creation. StenciGirl has a great stencil here. I would love to get to play with this one. That made me smile! 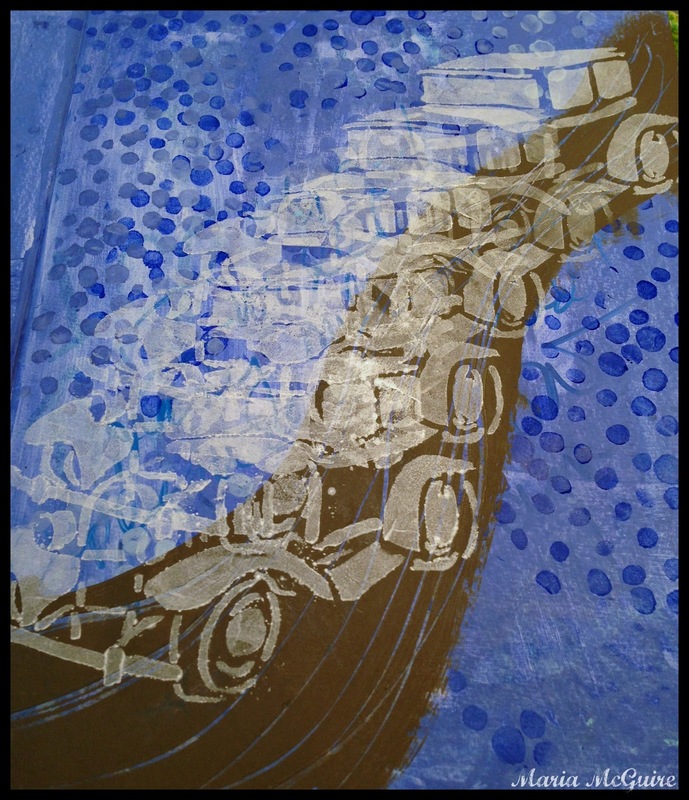 A traffic jam, love to see what other people see when they look at something I make! Beautifully done,I see the card leaving your house and it has no color, just on an adventure taking your so to school, when he arrives it is a very bright red, the color represents that he has arrived to a new stage in his life, full of vim, vigor and excitement. What a wonderful tribute to a child going away to college. How cool is this!?!?! 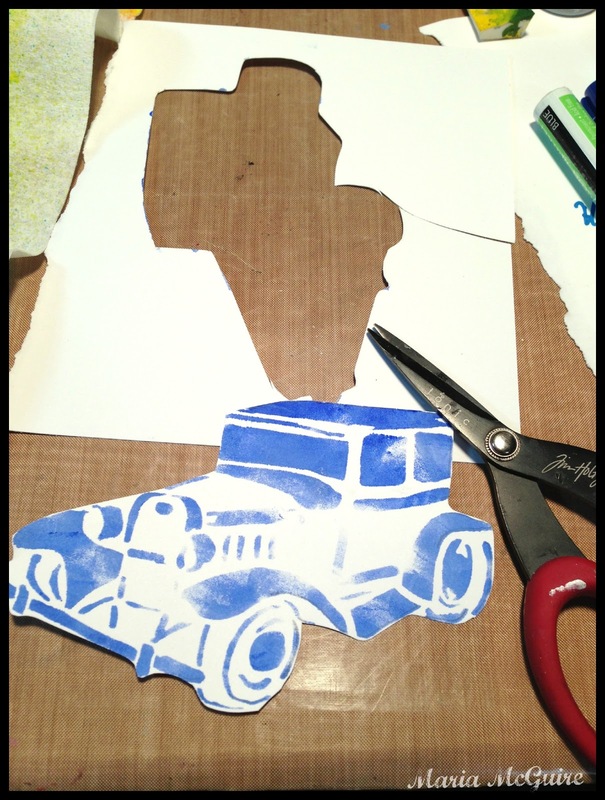 Love how you used Nat's car stencil... what a fabulous idea! !